The Sabres are in the midst of a 10 game winning streak and are going for a franchise record 11th straight tonight against divisional foe, the Tampa Bay Lightning. Buffalo is currently one point ahead of the Lightning, tied for first place in the Atlantic division, after Jeff Skinner put his league leading 19th goal home in overtime on Tuesday night against San Jose. What an addition Jeff Skinner has been to this team! He gets to play alongside Jack Eichel and those two feed off of each other so well, hence Eichel’s 23 assists. While Skinner and Eichel remain to be the only two players on the roster with 20+ points, the scoring has spread out rather evenly. Newcomer Conor Sheary has six goals and six assists for 12 points, good ole Jason Pominville has 18 points with an even split of nine goals and nine assists. 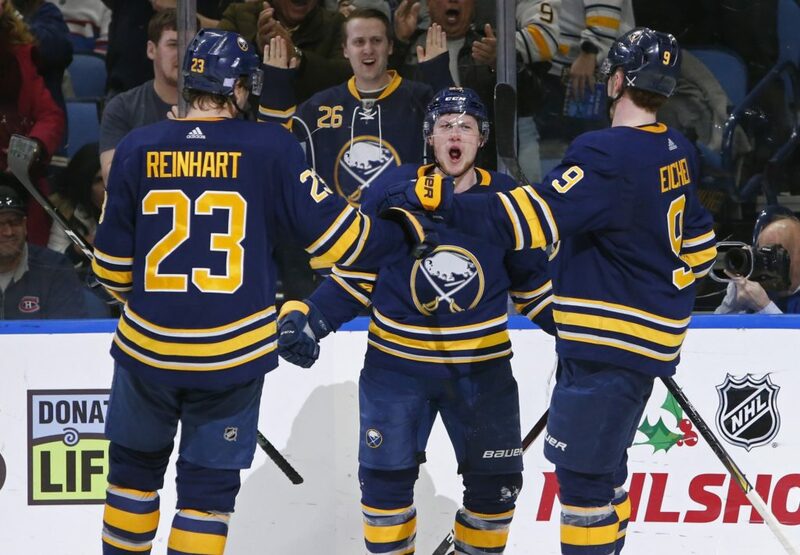 Meanwhile, former 2nd overall pick, Sam Reinhart, is second on the team in assists with 14, and rookie defenseman Rasmus Dahlin has two goals and 12 assists. On to the goaltenders… Carter Hutton went to Buffalo knowing this would be his first real shot to earn a full time starting role in the NHL and so far he has seized the opportunity. In 18 games started Hutton has posted a 12-6-1 record with a 2.50 GAA, which is 13th in the league for goalies who have started 10+ games, and a .920 save percentage. Linus Ullmark has also been solid in net going 5-0-1 in seven games started. You can’t win in this league without good goaltending but you can definitely win a lot of games with a good starter and a solid back up, which Buffalo certainly has had thus far this season. 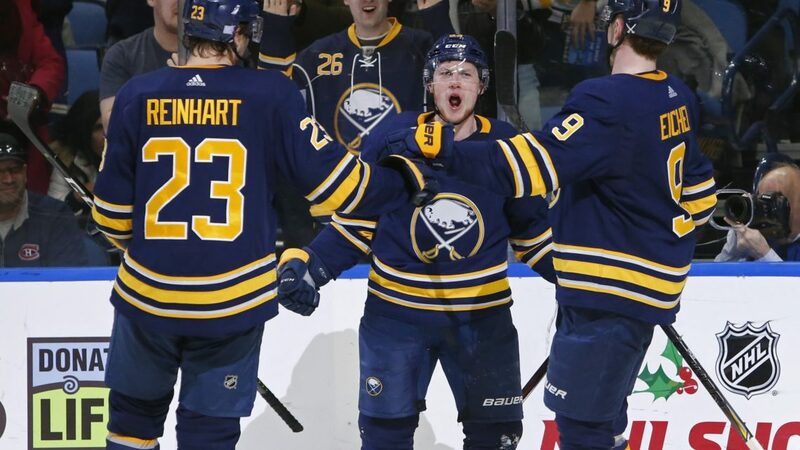 As a team, the Sabres have played well together, they use their youth and speed from Eichel, Mittlestadt, and Dahlin along with the grit from their veterans like Pominville, Okposo, and Scandella. The team has posted an 11-2-1 in the month of November and have won three divisional games during their winning streak. 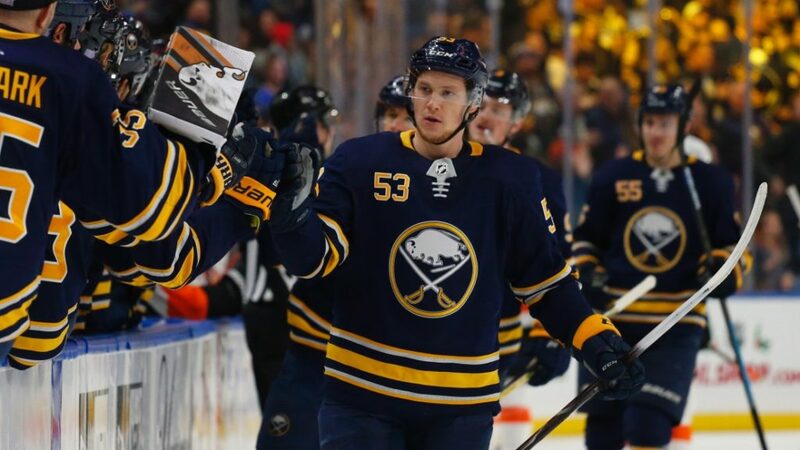 One thing that may make naysayers poo-poo the win streak would be the fact that Buffalo has won nine of the ten games by one goal, and seven of those wins have come in either an overtime win or shoot out win. But hey, a win is a win isn’t it? As long as the two points are earned that is all that matters right? That, along with the fact that this team refuses to give up when they are up against it. I’m not the only one who is noticing the latest streak by the Sabres, even the NHL writers who vote on the power rankings have Buffalo as the fourth best team in the league right now, only behind Nashville, Tampa (the Sabres opponent tonight), and Toronto. If Buffalo keeps this streak alive there is no doubt in my mind the team reaches the top three maybe even the top two next week. I hope this team stays healthy enough to stay hot and relevant amongst the league this year. When Buffalo has a good team, the city is fun to play in for the players, and when they make the playoffs there is potentially no bigger die hard fan base that supports the team. Stay hot Sabres, keep it rollin.